The Moving Bodies Team. Keeping kids moving since 1994. We’ve been keeping children moving since 1994! Created in 1994, Moving Bodies provide physical education programs for many Sydney primary schools. Starting with only a small handful of schools, Moving Bodies now works in over 30 schools around the Sydney Metropolitan area and employs more than 30 staff . Our programs are designed to get your child moving and enhance their fitness and physical development. Physical activities create a wealth of learning opportunities. Our programs contribute to your child’s mental, emotional and social development by using activities that challenge your child to solve problems, improve their performance over time, work with and get along with other children and get in touch with their body and mind. Aware of the demand within the local area for centre based activities and programs, owner Rebecca Ross opened the Moving Bodies Centre in April 2012. The Moving Bodies Centre offers programs outside the school system that complement your family’s lifestyle. The Moving Bodies Centre is a state of the art physical learning space designed specifically to support all programs and to meet the needs of children. The programs incorporate the latest thinking in physical education, child development, and health and wellbeing. Moving Bodies aim to make exercise fun in the hope that children will continue being active throughout their lives. Our programs are aimed at supporting and improving physical, cognitive, social and emotional development in a safe and fun environment. Our philosophy of encouraging, rather than forcing children, to try new things creates a non-threatening environment. We hope that this will then lend them towards trying other sports and physical endeavours. Moving Bodies believe in providing a supportive and safe environment for children where they feel welcome, safe and secure. Our Supervisors are all accredited in their area of expertise. Moving Bodies has an exemplary safety record thanks to our caring, professional and well trained staff. Bec’s love of Gymnastics began as a young four year old girl. She continued to train as a recreational and then competitive gymnast for the next 15 years. As a high school student, she progressed naturally into the role of gymnastics coach where she was able to give back to the club that nurtured her for so many years. Now as an Advanced Gymnastics Coach, Bec’s coaching experience has spanned more than 25 years from beginner to competitive. A unique employment opportunity presented itself in 1994 when Vickie Hill founded the company, Moving Bodies. Vickie, a qualified trained teacher, wanted to provide exceptional Gymnastics programs and experiences for local primary school children. Bec and Vickie worked for many years alongside each other and were dedicated to providing an excellent, enjoyable and active experience for children. By 2005, Bec’s mentor and inspiration, Vickie, was pregnant with her first child and so the Moving Bodies baton was passed on to Bec. Moving Bodies strives to be an excellent provider of a range of athletic programs across Sydney primary schools and as an extension of this, in 2012, Bec’s dream of opening a fitness facility offering a range of programs for local children became a reality. Bec’s passion for healthy living, Gymnastics and an overall active lifestyle provided the basis for these classes to be offered within a safe, supportive, encouraging and non-competitive environment. 2018 will see Moving Bodies expand yet again with another of Bec’s dreams coming to fruition – a continuation of other unique programs for the whole family including a Swim School, a Ninja Course and Parkour Centre. Bec has wanted to provide the local community and surrounding suburbs exposure to quality and unique exercise programs and in doing so, is also keen to provide local employment opportunities for both young and old. In July of 2017, Vickie Hill, founder of Moving Bodies, sadly passed away. Now more than ever Bec is determined to ensure that Vickie’s legacy lives on and continue to provide high quality programs for all. A part of the Moving Bodies team since 2004 Nadene is a Primary School Teacher and qualified in Gymnastics, Athletics and Swimming. 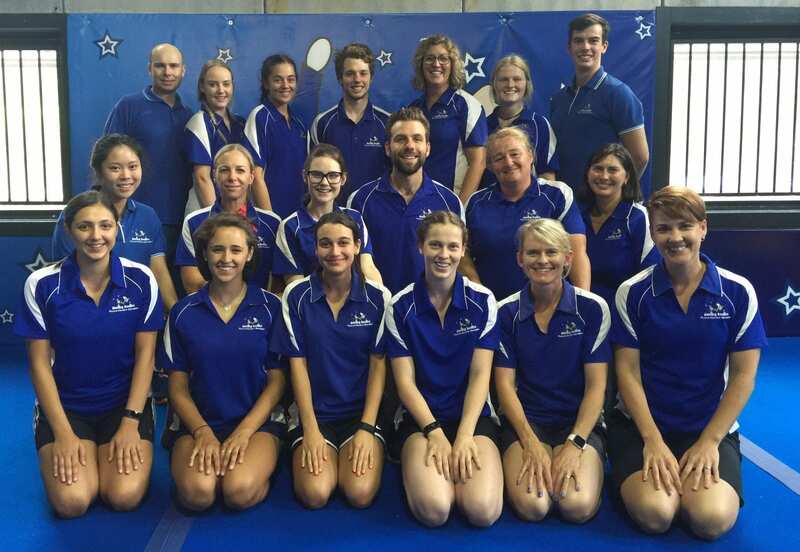 Nadene is a supervising coach of our Schools Programs along with being the Program Co-ordinator at the Moving Bodies Centre for the Kindergym and Recreational Gymnastics Programs, where she is also the Head Coach. Involved in sport her whole life, Nadene is a natural sportsperson who loves working with children and has a natural flare for teaching. Nadene is kept very busy with her role at Moving Bodies along with her 2 young children. Lisa joined Moving Bodies in 2012. Coming from a gymnastics background, Lisa representing Australia winning a Silver medal in the 1990 Commonwealth Games for Artistic Gymnastics along with World Championships in 1989, 1991 and Barcelona Olympics in 1992. Lisa has a Bachelor of Human Movement and Diploma of Education, along with being an Advanced Gymnastics Coach. Lisa is a supervising coach of our Schools Programs along with being our Program Co-ordinator at the Moving Bodies Centre for the Advanced Gymnastics Classes and Adult Gymnastics Classes, where she is also Head Coach. In her desire to continue to help others, Lisa is also a qualified Massage Therapist to add to her long list of qualifications. On top of all of her many roles, Lisa is kept very busy with her 2 children. Guy joined the Moving Bodies team at the beginning of 2012. Guy left his hometown, in the English Countryside, to pursue his passion of sport within Australia. From playing 15 years of soccer, and representing English School Boys for sprinting, Guy was a perfect fit for the Moving Bodies team. Obtaining his gymnastics qualification contributed to Guy’s wealth of knowledge from a wide variety of sports. Guy is a very popular supervising coach within our school programs and also the program co-ordinator for the Kids Fitness and Parkour classes at the Moving Bodies Centre. Guy’s passion to participate in a wide variety of sports himself, saw him introduce Parkour into the Moving Bodies Centre in 2015. The success of the Parkour is a reflection of the passion and enthusiasm that Guy puts into each and every one of his classes. When Guy is not teaching with Moving Bodies, he can be found surfing the waves of Sydney Beaches, playing soccer, mountain bike riding, rock climbing, ocean swimming, playing chess and participating in his own Parkour classes – just to name a few!